By Michael Schallock, Illustrations by Jessica Schallock. © Copyright April 2007. All rights reserved. The concepts illustrated in this short paper have been expressed by fine teachers for many years. However, many players still struggle with incorrect posture and a lack of ease of playing. By combining a discussion with careful illustrations we hope to assist in the understanding of how to hold the violin. Every individual must make many physical accommodations in order to play the violin. There are some beginning students with nearly perfect posture and the ability to hold the violin almost effortlessly and there are some very advanced and skillful violinists who still struggle with bad habits and poor posture. I think it is important to rationally examine violin technique, including the issues of posture, shoulder rests, and left hand mechanics. There are very good reasons for having a well balanced and relaxed posture. There are none for playing tensely and in pain. On the other hand there are good reasons for using a shoulder pad and there are also good reasons for not using one. Where there are differences in opinion and differences in individual students I believe that we must make rational decisions based upon a clear understanding of the issues rather than following fad or fashion or copying an individual violinist who may be quite different than our selves or our students. The violin should rest on the collarbone and be supported by the left hand and by the shoulder. Gentle weight from the head, with a relaxed neck, stabilizes the violin on the collarbone. The chin rest protects the top of the violin and adjusts for the length of the player's neck. As the violin strings are held parallel to the floor a shoulder pad is fitted to fill the slight space between the back of the violin and the player's shoulder. The shoulder pad should not prevent the violin from resting on the collarbone and should not be used to compensate for the length of the player's neck. A frequently overlooked function of the shoulder pad is to provide friction so that the violin neither pivots too easily nor slips off the shoulder. 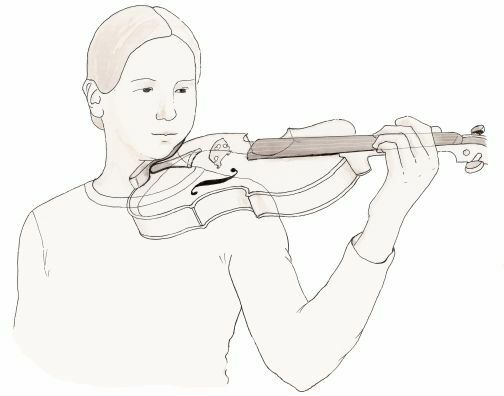 The violin may be held briefly by increased weight of the head on the chinrest in order to free the left hand but ongoing support of the violin shifts constantly between the left shoulder, jaw, and left hand, with contact with the collarbone remaining constant. 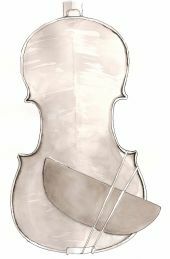 Low density foam pads in minimal contact with the back of the violin will not adversely affect the sound of the instrument. The violin can be held easily and comfortably for long periods of time if it is held correctly and if the chin rest and shoulder rest or pad are carefully fitted. The violin should rest on the collarbone. The purpose of the chin rest is to protect the varnish, provide a secure and comfortable place for the jaw , and to adjust the distance from the jaw to the collarbone. Generally, flatter simpler chin rests are more comfortable than more contoured ones. A chamois skin or other non-slippery cloth may be used to cover the collarbone for comfort. The violin resting lightly on the collarbone and the jaw resting gently on the chin rest establish two stable points of contact with the instrument. The violin is also supported, but not held tightly, by the left hand. The neck of the violin should rest gently against the base knuckle of the first finger of the left hand. The side of the thumb should lightly contact the neck of the violin across from the first or second finger. 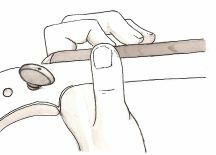 The base of the first finger provides most of the support for the neck of the violin with the thumb providing gentle counter pressure so that the violin does not slip down into the web of the thumb. The jaw, collarbone, base of the left index finger and the side of the left thumb establish four contact points with the violin. It is beneficial to have the student spend some time simply holding the violin lightly with these contact points. I instruct my students to walk around slowly, paying attention to balance and posture, and noting how easy it is to hold the violin in this manner. The instrument is supported by the collarbone and the base of the first finger. The jaw on the chin rest and the left thumb provide stability and may be intermittently more active in supporting the violin. Gravity pulls the violin downward. That force is countered by the collarbone and the base of the first finger assisted by the thumb. Any extra pressure by the thumb or jaw (weight of the head or twisting of the neck) slightly increases stability but greatly increases tension and should only be employed lightly and temporarily. Thus the violin should be supported and held as gently as possible. An average adult arm weighs six to ten pounds. A violin with foam pad weighs about one pound. The force exerted by the left hand to hold up the neck of the violin is less than six ounces. It is very important that the student has a correctly balanced body and learns to properly support the partially extended left arm with relaxed shoulder and back muscles. Many players hold the violin much more tightly than is necessary both with the jaw and the left hand. I think that most often this habit is formed by the player's sense that the violin will "slip away" because they have never learned to properly support the instrument. After the student becomes comfortable simply supporting the violin he can now begin sliding the hand up and down the neck of the violin maintaining the four contact points and perhaps slightly releasing the already light counter pressure of the thumb. As the hand moves past third position into higher positions the thumb must move under the neck for support and to allow the left hand to reach higher on the fingerboard. The hand now comes lightly into contact with the body of the violin. For more advanced students the full range of vibrato movements should be slowly and carefully explored with the hand in first position. (See Simon Fischer's two books, Basics, and Practice, Peters Edition). A full and comfortable vibrato can be produced with the arm, wrist, hand or combination with the base of the first finger lightly sliding against the neck of the violin, and in some cases moving slightly and briefly away from the neck. It is important to note the slight rotation of the left forearm in helping to produce the required finger motion. Without this rotation it will be much more difficult or impossible to vibrato without completely releasing the contact with the base of the first finger. For some styles of vibrato and during shifts of position it is beneficial to free the left hand of some of the responsibility of holding the violin. A shoulder rest or pad of some sort is necessary to prevent the instinctive upward shrugging of the player's shoulder to increase support and friction. 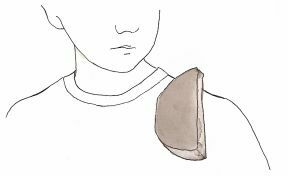 If the player's shoulder is sufficiently broad and not markedly sloped downward from the player's neck, very little, if any, shoulder pad is required. More sloped shoulders and thinner physiques require a thicker pad or shoulder rest. A critical function of the shoulder pad is to provide some degree of friction so that the violin neither pivots too easily nor slips off the sloping shoulder. Often the use of some type of non-skid pad, even though quite thin, will offer the security the player has been attempting to achieve with a rigid rest. The thickness of the pad or the shoulder rest should have no relationship to the length of the player's neck. 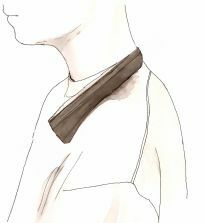 The distance from the mid point of the collarbone to the jaw, i.e., the length of the neck, is accommodated by the height of the chin rest. Note that the distance from collarbone to jaw is not the same as the thickness of the violin plus chin rest. The violin rests on the collarbone at an angle. Because of the slight tilt of the violin the distance from collarbone to jaw is actually greater than the thickness of the instrument. I think that the erroneous perception of long necks needing higher shoulder rests may also stem from the relationship between the angle of the violin and the slant distance. As the forward tilt of the violin is increased, so is the apparent thickness of the instrument as measured on a slant. Generally, as shoulder rests are adjusted to be higher the effect is to tilt the violin more toward the E string side. This is undesirable and has the effect of prying the jaw higher in the air by twisting the violin. With the violin supported gently by the collarbone and the left hand, and with the strings approximately parallel to the floor, note the space between the back of the violin and the top of the player's shoulder about midway between the player's neck and the top of the shoulder (deltoid). It is this space that should be filled with the shoulder rest or pad. It is generally a space of less than an inch. The pad will cross the back of the violin at an angle as the player holds the violin at an angle to the shoulder. The elastic holding the pad should be fastened to the end pin of the violin and will extend across the back and can be looped over the corner of the lower bout on the G string side. Attaching the elastic to only one bout will hold the pad less tightly to the back and will allow the violin to vibrate more freely. Commercial pads should be trimmed to remove excess material both for appearance and to minimize muffling. To properly position the pad place it on the shoulder as shown. Then bring the violin up into playing position. Holding the pad in place on the back of the violin, take the violin away from the shoulder and turn it over. Secure the pad with the elastic band. Adjust the position of the pad slightly for comfort. With the use of the shoulder pad the violin now has three points of contact resisting the downward force of gravity: the collarbone, the top of the shoulder (pad), and the base of the first finger assisted by the thumb. Only two contact points are required to support the violin. Therefore the left hand can assume a more, or less, active supporting role depending on the use of vibrato and the occurrence of shifts. As the left hand plays a less active role in supporting the violin, slightly more weight on the chin rest will stabilize the violin as it rests on the collarbone and the shoulder pad. The violin will be stable with three contact points. Active support shifts between the left hand and the jaw. The contact with the collarbone remains constant. 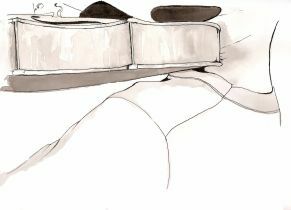 A word of caution here: it is common to use a shoulder rest or pad that is too thick, lifting the back edge of the violin off the collarbone. The violin is then positioned like a teeter totter with the chin on one end, the left hand on the other end and the shoulder rest serving as the pivot point. This arrangement is very unstable. When the jaw presses down the scroll tends to pop up. The left hand has to constantly adjust because the fingerboard is moving. The player's neck and jaw, and left hand become tense as the player seeks to provide a necessary degree of stability. I believe that this misplacement of shoulder rest or pad has also contributed to the erroneous conclusion that players with long necks need higher shoulder rests. Using the collarbone, jaw, and shoulder pad frees the left hand. Using the collarbone, thumb and base of first finger, frees the head and reliance on the shoulder pad. 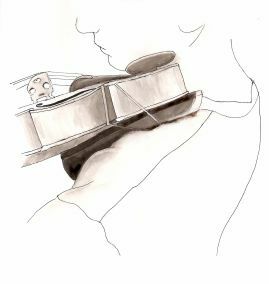 The violin must always rest on the collarbone (or the clothing covering it, or a chamois skin for comfort), with varying degrees of support from the shoulder pad and the left hand. The roles of the jaw, the shoulder pad, and the left hand vary constantly with playing, and without undue reliance on any one or two of the three contact points the violin can be held comfortably for long periods of playing. The shoulder rest or pad should provide friction so that the violin does not easily slide or rotate off the shoulder. Even with the use of a shoulder pad the violin will tend to pivot to the player's right. Gentle support from the base of the first finger will rotate the violin back to the left. Most shoulder rests fix the violin in one place too rigidly. Immobility of any part of the body for very long causes pain and stiffness. The violin must be allowed to tilt more or less as the player desires. The violin must also be allowed to pivot both further back than normal and more in front than normal. This accommodates different arm lengths and different playing circumstances. Shoulder rests that are contoured or curved over the shoulder are designed to keep the violin from slipping off the shoulder and to prevent the violin from pivoting. Unfortunately, these excessively rigid designs also may prevent the healthy and normal motions of the violin around the player's body. Most shoulder rests tilt the violin too far, lowering the E string. The player then attempts to stabilize the violin by twisting his neck sideways instead of relaxing his head onto a more horizontal chinrest. This also results in a counter pressure by the player's left shoulder and back. Playing with this degree of left sided tension is difficult and fatiguing. 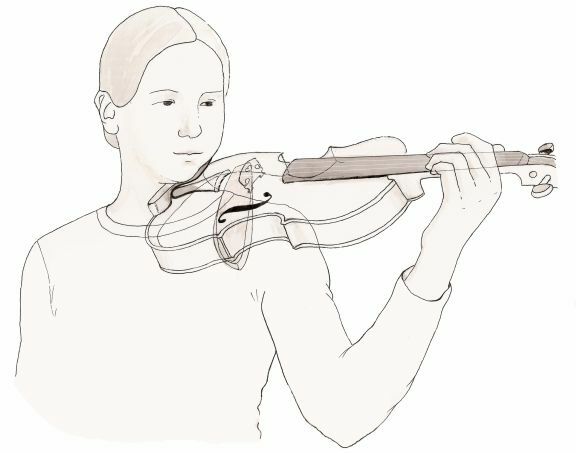 The violin should rest solidly on top of the collarbone instead of being held to the upper chest by the player's twisted neck. The exaggerated tilt of the violin results in the bow having to be "pressed" sideways into the strings instead of resting on top of the strings assisted by gravity. The inappropriate hesitancy of some players to use any form of shoulder rest or pad will usually result in painful hunching of the shoulder and back to provide additional support when shifting and using certain styles of vibrato. Rigid shoulder rests have minimal but varied effects on the violin's sound. Large sponges or pads of higher density foam held in contact with the back of the instrument adversely muffle the sound. The use of low density foam padding held in minimal contact with the back of the instrument does not seem to adversely affect the sound. It is the teacher's responsibility to fit the chin rest and shoulder pad and to teach the student to properly support the violin with the left hand, shoulder and jaw. The teacher must ensure that the left hand is properly positioned and is being used correctly to support the violin as well as shift, play notes and vibrate. Undue reliance on any single aspect of the entire system of support will cause tension and pain. Finally, the teacher and player must be aware that physical growth of younger students, changing muscle mass, significant changes in playing style and maturity, number of hours played and changes in standing or sitting posture all may necessitate changes to the chin rest and/or shoulder padding.